349 Marlborough is located on the north side of Marlborough, between Gloucester and Hereford, with 347 Marlborough to the east and 351 Marlborough to the west. 349 Marlborough was built ca. 1872 for builder and contractor George Martin Gibson, for speculative sale, one of eleven contiguous houses (337-339-341-343-345-347-349-351-353-355-357 Marlborough). Click here for an index to the deeds for 349 Marlborough. On June 14, 1873, 349 Marlborough was purchased from Hiram Gerrish by crockery merchant James Morse Allen. He and his wife, Marietta Gardiner (Cary) Allen, made it their home. They continued to live at 349 Marlborough during the 1876-1877 winter season, but moved thereafter. 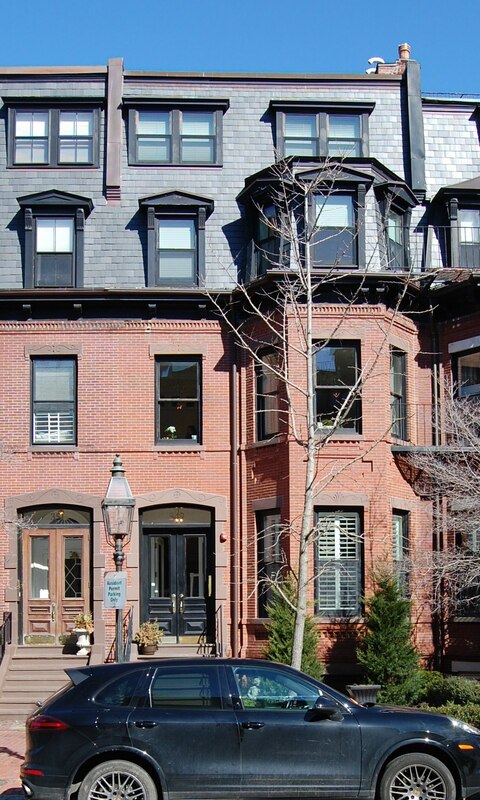 By 1880, they were living at 53 Spruce Street. By 1878, 349 Marlborough was the home of insurance broker George Munroe Endicott and his wife, Mary Elizabeth (Chapman) Endicott. They had lived in Canton in 1877, and by 1880, they were living in Newton. On February 21, 1878, James Allen transferred the property into his wife’s name. On October 18, 1878, 349 Marlborough was acquired from Marietta Allen by Arthur Grimes Stanwood, cashier of the Chicago, Burlington and Quincy Railroad. He and his wife, Annie Louise (Russell) Stanwood, made it their home. They previously had lived at the Hotel Berwick (Columbus Avenue at Holyoke). On June 30, 1880, he transferred 349 Marlborough into his wife’s name. The Stanwoods continued to live there during the 1881-1882 winter season, but moved thereafter to 24 West Cedar. During the 1882-1883 winter season, 349 Marlborough was the home of fertilizer manufacturer Robert Stow Bradley and his wife, Leslie (Newell) Bradley. They previously had lived with his parents, William and Frances (Coe) Bradley, at 61 Commonwealth. By the next season, they had moved to 216 Commonwealth. On August 13, 1883, 349 Marlborough was acquired from Annie Stanwood by Dr. George Adams Leland, an ear, nose, and throat specialist. He and his wife Alice (Higgins) Leland, made it their home, and he maintained his medical office there. They previously had lived (and he had maintained his office) at 12 Hancock. 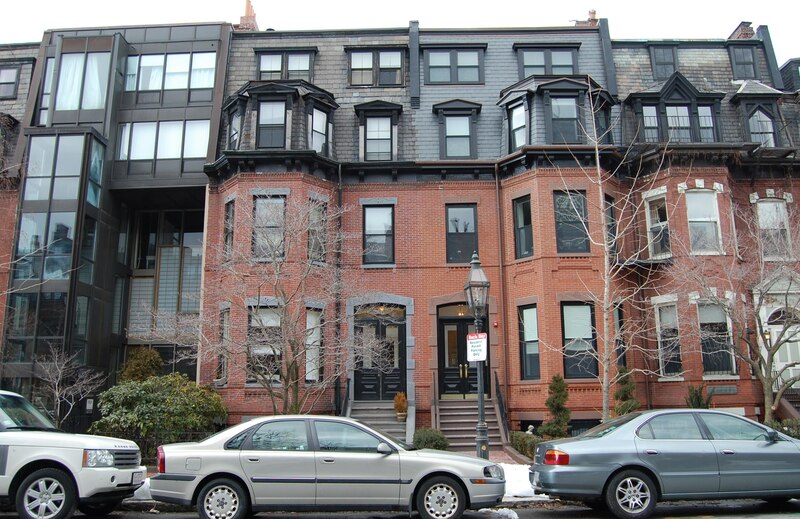 They continued to live at 349 Marlborough during the 1888-1889 winter season, but moved thereafter to 295 Boylston. On April 7, 1879, 349 Marlborough was acquired from George Leland by Miss Mary Vitalis Iasigi. She and her sister, Miss Eulalie M. Iasigi, made it their home. They previously had lived at the Hotel Kensington at 687 Boylston. They continued to live at 349 Marlborough until Eulalie Iasigi’s death in August of 1922, after which Mary Iasigi moved to an apartment at The Abbotsford at 186 Commonwealth. 349 Marlborough was not listed in the 1923 Blue Book. On April 27, 1923, 349 Marlborough was acquired from Mary Iasigi by Dr. Francis Cooley Hall, a physician. He and his wife, Priscilla (Perry) Hall, made it their home and he also maintained his office there. They previously had lived at 226 Marlborough. They also maintained a home in Nahant. In 1925, Francis Hall moved his office to 372 Marlborough. They continued to live at 349 Marlborough during the 1925-1926 winter season, but moved thereafter to Chestnut Hill. On June 15, 1926, 349 Marlborough was purchased from Francis Hall by Francis Calley Gray, an attorney and trust company executive, and his wife, Helen Rotch (Bullard) Gray. They previously had lived at 293 Marlborough. They also maintained a home at Nonquitt, Massachusetts. 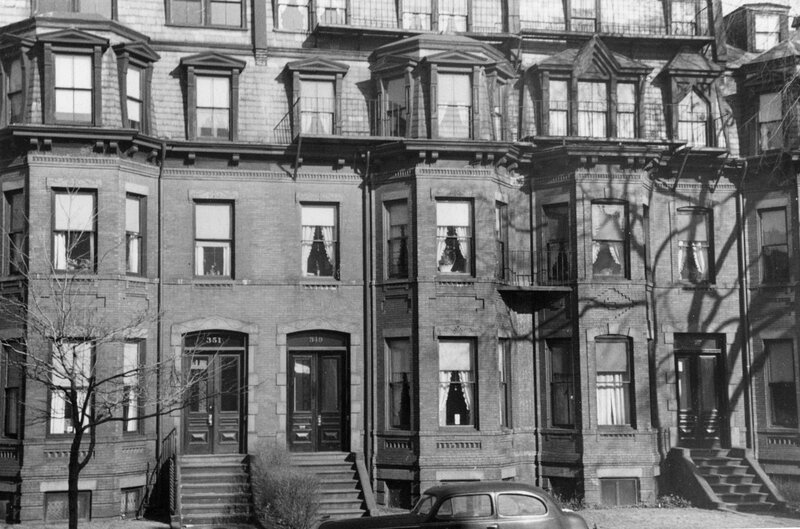 The Grays continued to live at 349 Marlborough until about 1950, when they moved to 62 Beacon. On October 11, 1950, 349 Marlborough was acquired from the Grays by real estate dealer Thomas J. Diab. On July 16, 1951, 349 Marlborough was acquired from Thomas Diab by telephone company executive Frank Henry Rowland, Jr., and his wife, Rose Julie (Cunningham) Rowland. They previously had lived in an apartment at 407 Marlborough. They had owned 407 Marlborough and Thomas Diab acquired it from them on the same day as they acquired 349 Marlborough from him. In July of 1951, they applied for (and subsequently received) permission to convert the property from a single-family dwelling into five apartments. Frank and Rose Rowland lived in one of the apartments and his parents, Frank, Sr., and Sarah Jane (Swinimer) Rowland, lived in another. They previously had lived in Arlington. Sarah Rowland died in 1954 and Frank Rowland, Sr., died in 1959. In November of 1955, the Rowlands applied for (and subsequently received) permission to convert the property from five to six apartments. From about 1956, Rose Rowland’s mother, Claire M. (Brogan) Cunningham, the widow of James R. Cunningham, also lived at 349 Marlborough. In May of 1959 Frank Rowland purchased 351 Marlborough and converted it into five apartments. The Rowlands and Mrs. Cunningham continued to live at 349 Marlborough in 1961. In September of 1961, Frank and Rose Rowland purchased and subsequently moved to 297 Marlborough. Claire Cunningham moved with them. On January 26, 1963, 349 Marlborough was purchased from the Rowlands by Dr. Lloyd Harold Warshauer and his wife Esther E. (Hamm) Warshauer. They lived in Waban. 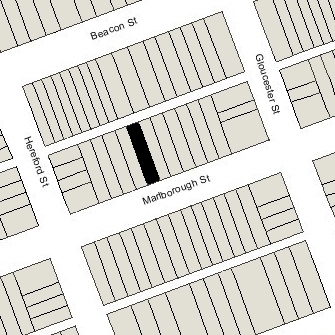 They also owned 341 Marlborough and in June of 1963 would acquired 343 Marlborough. On June 13, 1985, Lloyd and Esther Warshauer transferred 349 Marlborough to their son, Mark Edward Warshauer, as trustee of the Warshauer Family Realty Trust. On February 25, 2009, 349 Marlborough was purchased from the Warshauer Family Realty Trust by the 349 Marlborough LLC (David Pogorelc, manager of record). 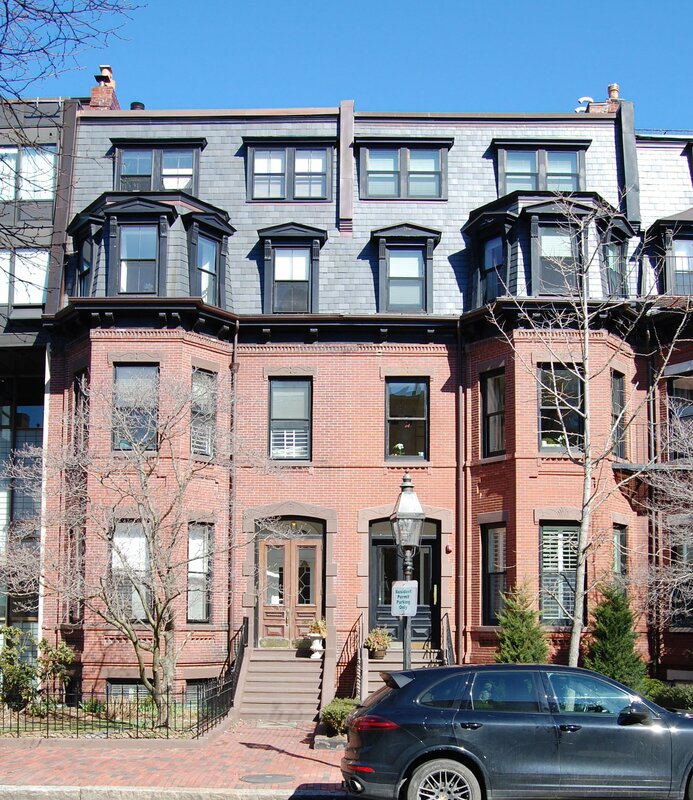 In June of 2009, the 349 Marlborough LLC filed for (and subsequently received) permission to remodel the existing six apartments and install a roof deck. It subsequently amended the plans to reduce the number of units to four. On June 7, 2010, it converted the property into four condominium units, the Heaven at 349 Marlborough Condominium.